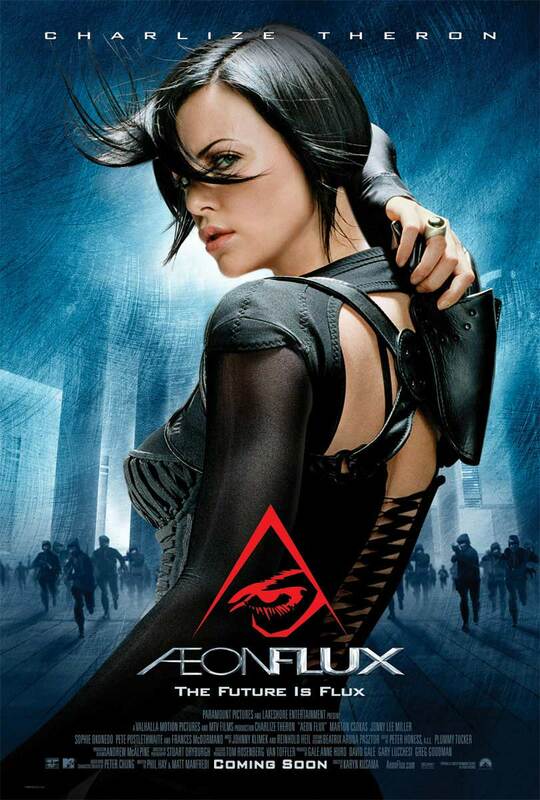 released a mere three months before ultraviolet, aeon flux was also not screened for critics. it was released the weekend after thanksgiving, which like labor day weekend and all of january, is more or less the dumping ground for movies that studios give up on. other entries in the post-thanksgiving weekend include forgettable genre/b-movies like trapped in paradise, white man’s burden, wild bill, daylight, gus van sant’s “scene by scene” remake of psycho, equilibrium, turistas, awake, armored, and the warrior’s way (ninjas, damn). based on the cult mtv animation, perhaps a sign that they are not satisfied with only playing music related things (it’s not like they’re named after it or anything), this live action adaptation came a whole decade after the show went off the air. in a bit of irony, while most movies tries to more and more like video games and anime, aeon flux actually looks more realistic than most. it doesn’t do the cgi/digital backgrounds and sets like ultraviolet. it’s probably the logical approach since it would be pretty hard to try to emulate the show’s highly stylistic animation with real life settings and actors. like ultraviolet, the plot has to do with some kind of futuristic virus in the year of 2011. a scantily clad heroine is out to overthrown the reigning government in a dystopian society with action and martial arts, and gymnastics. instead of ripping off gloria (the cassavete one, hopefully not the sharon stone remake) as the whole premise, aeon flux doesn’t directly remind me of any specific movie. there’s a bit of it that’s similar to minority report but that’s about it. based on the result of my crack research team, charlize theron is definitely not the same person as milla jovovich. instead of the raver look in ultraviolet, charlize dons the tight fitting black cat suit. she also has better hair in my opinion. milla jovovich looks good in ultraviolet in comparison to the resident evil movies but she’ll never top the fifth element look. it’s also more of a novelty to see charlize theron in the action movie heroine role. maybe it’s just me but i think she looks better here than she did in monster. but there i go talking about hair and clothes again. aeon flux does have more of a plot and ideas than ultraviolet. i could go on and describe further plot points such as conspiracy and cloning and politics, but they are such scifi staple standard issues that i doubt anyone will remember them after the movie’s over. i guess i could appreciate that they still try to have a story and big ideas even though they don’t add up to much. while short on plot, ultraviolet intends to wow you with amazing looking sets, background and action set pieces. and aeon flux falls short in this department as well. there’s one decent sequence involving aeon flux jumping and falling trying to catch the bottom part of a blimp, but most of the other action scenes are pretty typical combat/gun fight/explosion that’s in line with plenty of direct-to-video b-movies. it also doesn’t help that there’s a deadly sense of drabness and seriousness looming over the whole movie. say what you will about ultraviolet but the obvious, intentional digital fakeness gives it a sense of fun, something that’s lacking in aeon flux. having only seen a few episodes of the tv series, i recognized a few shots directly referencing the series. i also like the inventive gadgets and devices from unexpected objects such as the whistling metal ball bombs, the message in water, the skin bandages and the easy button that transforms dimensions. i also like how they got veteran actors like frances mcdormand and pete postlethwaite (whose gravitas prevents his part from being as laughable as it could have been) in the movie. not that they are given much to do. and they probably filmed their scenes in one day. unfortunate that the bland villains (johnny lee miller from hackers and trainspotting, marton csokas from tv’s xena and those rings movies) get more screen time. this is also charlize theron’s first major release after winning an oscar for monster, some say a curse that also plagues the nicole kidmans, mira sorvinos, and cuba gooding jr. at least it’s not a catwoman type catastrophe. it’s also another sad case where a director who moves from a critically acclaimed indie film, girlfight in this case, to the blockbuster arena and ends up in a worse place. director karyn kusama went on to direct jennifer’s body. see also: bryan singer, doug liman, paul greengrass, justin lin, dominic sena, david gordon green. like ultraviolet, aeon flux is supposedly recut (according to the screenwriters who also did crazy/beautiful and jackie chan’s tuxedo) by the studio to make it more of a traditional mainstream action heroine movie. there is suppose to be a two hour director’s cut, though according to the creator of the animated series peter chung, that version would not be that much better than the 93 minute theatrical version. either way, it’s a prime example of a rather miserable experience for all when a major corporation plunks down $62 million dollars on a cult item and chisels away the edges in hope of a mainstream franchise. and there you have it, neither one is better than the other. a battle between the lesser of two evils. you can go with charlize’s subtly ambitious underwhelming action movie or the gamey milla repetitive monotonous brighter scheme movie. it’s a draw if you ask me. p.s. my impeccable instinct to pair up movies doesn’t serve me quite well this time. 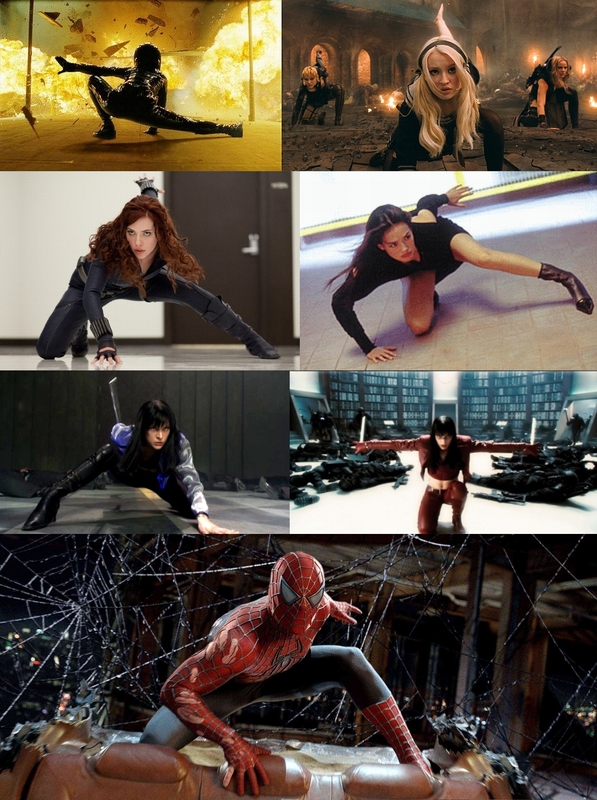 having spent three hours on two similar and equally lethargic movies i have to say i am quite sick of the graceful one-knee stick-to-landing pose in movies. i don’t know if it’s the matrix influence but does anyone know when this was first started? it’s not as bad as the bullet time effect or slow mo in front of explosion or the two guns but down there with shooting guns sideways and the shaky came post-action avid farts. aeon flux is currently available on netflix instant. The worst part about this one was the African American woman with hands for feet. How they couldn’t see what kind of an image that was is beyond me. i just figured it’s something from the original tv show, something that works in animation form but looks awkward in live action with real actors. and i’m curious what you think of the twins robots in transformers 2. not that you should go see it if you haven’t. this movie really had no chance. the animation on the show was so striking i think they would’ve been better off just making a feature length animated one. but then maybe the brief episodes worked better. Saw Aeon Flux when it came out on DVD; never watched the original animated series. From what I recall, I wasn’t overly pleased with the film (I remember going through a few parts on fast forward) but compared to Ultraviolet… yeah, then it’s good.